About 9 kms from Tuni, is the famous temple of Talupulamma, situated on a hillock overlooking green fields, valleys and streams . A small waterfall discharges nearly 2.5 lakh litres per day which is considered as holy water. Mukteswaram is a village in Konaseema Delta of East Godavari District of Andhra Pradesh, India. It is situated near the River Goutami, a branch of the Godavari. It is notable for its temple to Shiva. The village is connected by a bus line to nearby Amalapuram, and the nearest rail station is at Kotipalli. The place is famous for coconut plantations. A famous temple of Lord Ganesha located at Ainavilli Village is just 1 km from the place. Palakollu is located in West Godavari district of Andhrapradesh in India. Thhis place is famous for Lord Shiva (Eshwara) temple which is considered as one of the Pancharama temples. 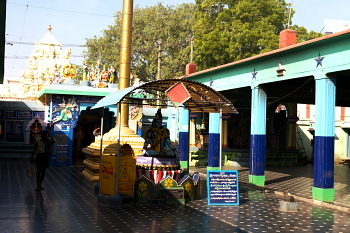 The temple here is called Sri Kshira Rama Lingeshwara swamy. This is the site of the renowned Ksheera Ramalingeswara Swamy temple, one of the Pancharama Kshetras in Andhra Pradesh. According to a legend, the temple stands on the spot where Lord Siva shot an arrow into the earth to draw out milk to satisfy his hunger. Built during the 10th-llth centuries A.D. by the Chalukyas, it represents the south Indian style and has a 9-storey gopuram that soars 125 feet, one of the tallest in Andhra Pradesh. Colourful images and sculptures of various deities are engraved on the walls and can also be seen inside the temple complex.